Before I get started with today's topic, I want to give a big congratulations to Nasa Hataoka for winning the Kia Classic. It was Nasa's third win on the LPGA Tour. Nasa finished 3 strokes better than five different players. Last year's tournament provided us with what might have been the most exciting event of the entire 2018 season. Pernilla Lindberg, Inbee Park and Jennifer Song were all tied after 72 holes, forcing a three way playoff. After playing the 18th hole three times, Jennifer Song was eliminated. Inbee and Pernilla would play the 18th hole one more time, before play was suspended due to darkness. They resumed the next morning, and after playing three more holes we still did not have a winner. Finally, on the next hole Lindberg would sink a 25 foot winning putt. Pernilla Linberg holds up her 2018 ANA Inspiration trophy. Lindberg makes the leap into Poppie's Pond. This will be tournament #8 of 33 on this year's LPGA schedule, and the first of five Major Championships. History: This event began in 1972 and became a Major in 1983. My strength of field rating is a super strong 89.5% (up from 87.5% last year when it was the strongest field of the year) making it by far the strongest field of this year by far. The only way it could be stronger was if more top players from other tours were invited. Seventy-three of the top seventy five players from the LPGA Priority List, and the entire top 25 on this week's Rolex World Rankings will be teeing it up. Jiyai Shin (#23 in the world rankings) and Mamiko Higa (#42), are the two stars teeing it up from other tours. 2- Ariya Jutanugarn - Could retake top spot with a victory here. 3- Minjee Lee - Always a threat. 1- Nelly Korda - Because she's on the leaderboard every week. 2- Lexi Thompson - Her favorite course. 3- So Yeon Ryu - Always steps it up in majors. 1- Anne Van Dam - This course fits her game. 2- Jodi Ewart Shadoff - Playing the best golf of her career. 3- Stacy Lewis - Has played just 3 events in past year, but plays well here. So Yeon Ryu had her cut streak snapped at 31 straight. Brooke Henderson also missed the cut for the first time in her last twenty starts. Nasa Hataoka makes the most important jump this week going from #7 to #4. 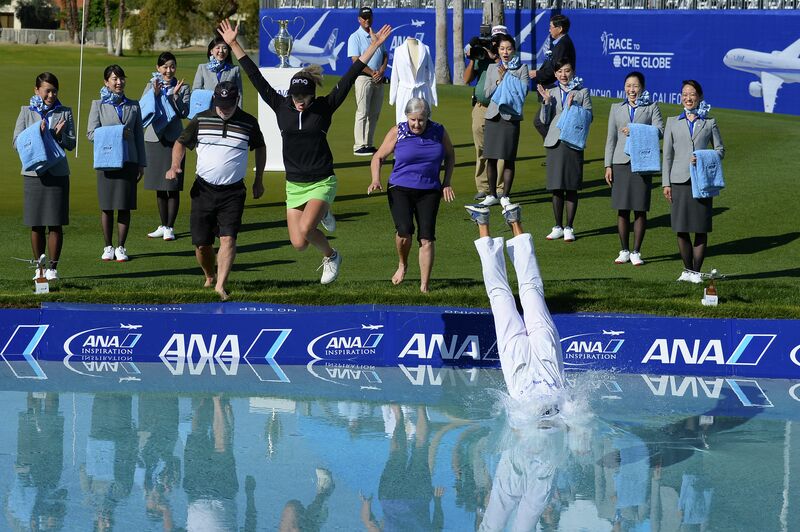 Azahara Munoz leaps from #41 to #34, while Stacy Lewis rises from #75 to #67. On the downside, So Yeon Ryu drops out of the top five for the first time in recent memory. She falls to #7. Jin Young Ko takes over the lead this week from the idle Nelly Korda with 1,332 points. Nelly is in second place with 1,155. They are followed by Sung Hyun Park with 907, Eun-Hee Ji 772, and Azahara Munoz 744. Jessica Korda takes over the lead this week with a score of -1.5. She is followed by Angel Yin -1.125 and Minjee Lee -1.1. Azahara Munoz and Jin Young Ko both registered their 4th top ten of the year. Only Nelly Korda (5) has more. Nelly is the only player to register a top ten in each of her starts. Angela Stanford has not finished better than 56th this year. Since the year 2000, only one player has won this championship 3 times. Can you name her? Is it me, or did the attendance (other than at the 18th green, which is always crowded) at the ANA look very sparse? I was hoping to attend it myself, but unfortunately wasn't able to. Watching on tv, it looked like there were only a handful of people in the "gallery" (if you could even call it that) on every hole, even for the leaders. This wasn't just for the first couple of rounds, but on the weekend as well for this first major of the season. There are a lot of great women players out there these days, hopefully the LPGA Tour is doing all they can to support them, and vice versa.